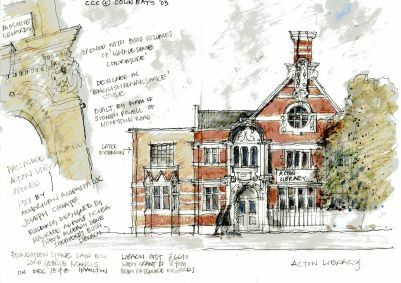 AGM and Talk on Gunnersbury Park Museum by Angharad Howell and Julia Tubman. Author Beezy Marsh will talk on the writing of her book “All my Mother’s Secrets” about life in Acton, and the sequel. Talk on the history of Chiswick House and Marble Hill by Dr Esmé Whittaker, the English Heritage curator responsible for interiors at Chiswick House and Marble Hill. Talk by Kyria-Josephine Sewell - "Two Countesses of Acton" Derwentwater 1720 and Landsfeld 1849. Christmas Event and speaker to be advised. Barbara Humphries to talk on “The Labour Movement in West London 1918-70”. “Ham’s Eccentric Princess” a talk by Sir David Williams. Anthony Smith to give a talk on “The London Loop”, a round London footpath. AGM and Talk To be advised. Visit to Conolly Dell in Hanwell which is part of Brent River Park. This rest garden was formerly part of the gardens of Dr John Conolly who was the superintendent of St Bernard's Hospital. Friday 5th July 11.30 p.m.
Visit to Gunnersbury Park Museum – tour led by the Curator, Julia Tubman. (Requests to participate to info@actonhistory.co.uk). Saturday 10th August 2.30 p.m. 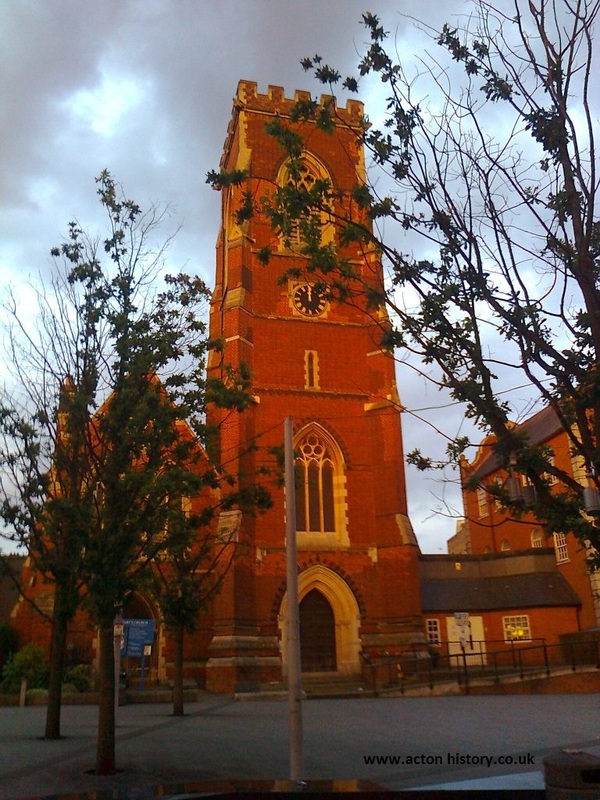 Walk in North Acton - Details to be confirmed. (Requests to participate to info@actonhistory.co.uk). 2020 - Date to be advised. 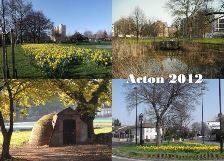 Acton History Group have been researching the different aspects of Acton’s history for many years. 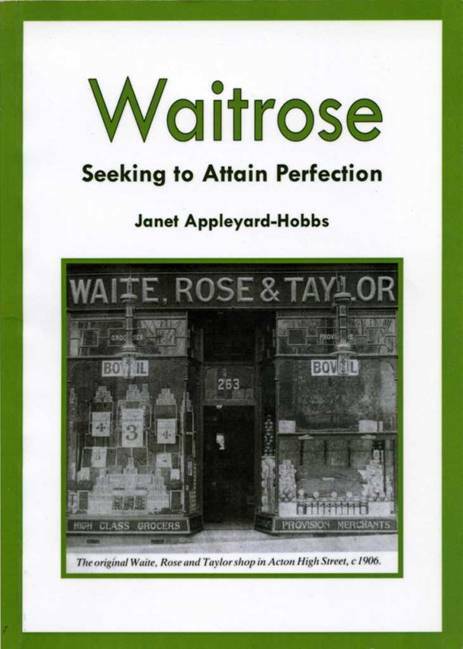 This booklet on Waitrose follows a very successful evening the Acton History Group organised in February 2005, featuring a talk by Janet Hobbs’s on ‘Mr Waite, Mr Rose and Mr Taylor in Acton’ and the unveiling of the plaque to mark the site of the first Waitrose shop. 'Seeking to Attain Perfection' was the motto or slogan used by the first Waitrose shop in its advertisements at Christmas 1908. Shopping was an important part of life in Acton in 1904. It was a time of great change along the High Street. 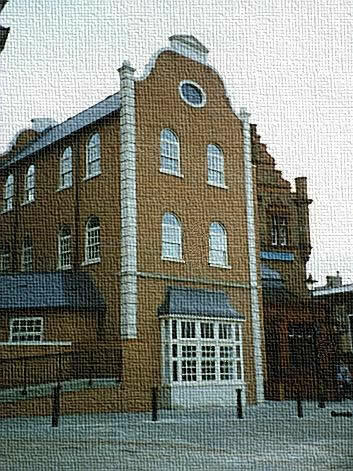 The Fire Station had not long been opened, the new Woodlands Park and Crown Street had recently been created and the group of buildings rising up Acton Hill, just opposite today’s police Station, had only just been built. So the new shop in this parade was all set to be an asset in this area of town. It was not long before more Waitrose outlets appeared in Acton, now Waitrose is a household name across the country. Hot off the press – your chance to snaffle up a copy of this Acton History Group publication. 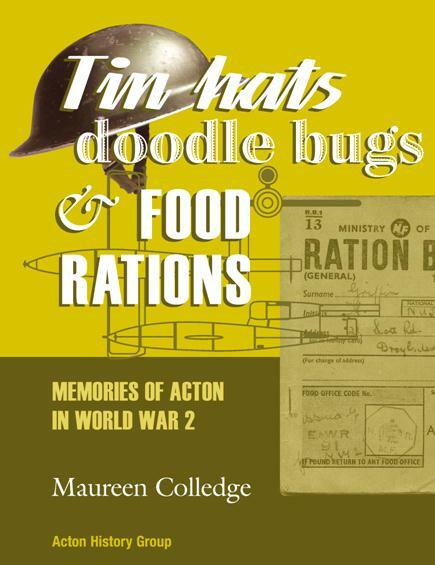 “Tin Hats, doodle bugs and food rations” tells the story of Acton and Acton people throughout World War 2. It’s packed full of photos, many never published before, and anecdotes, as well as well-researched historical facts. Covers the build up to war, through the blackout, bombing, evacuation, rationing, wartime production to the Victory celebrations in 1945. 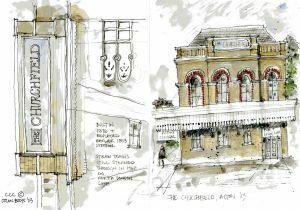 Local artist Colin Bays has created a set of four cards featuring various architectural highlights of Acton. 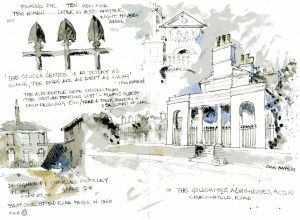 Two of them show gems of Churchfield Road: the Almshouses and The Churchfield pub. Notes about the building's history are also included on each card. Further details: blank interior, A5 folded, envelopes included. Each set costs £4.00, 40p of which will be donated to the Acton History Group. 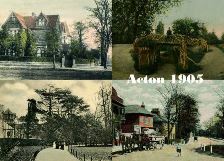 actonhistory.co.uk has created a pair of large glossy postcards each featuring four Acton scenes in about 1905 and a similar view in 2012. Notes about the scenes are included on each card. Further details: blank back, A5 sized, envelopes included. 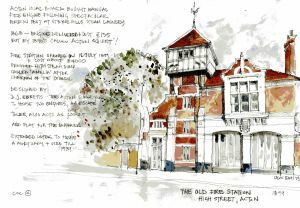 Each set costs £1.50, and the profits will be donated to the Acton History Group. | Contact Us | The whole of this site is © D Knights 2004-12.